for laboratory research with a faculty mentor. In addition to participation in research, the program includes mandatory workshops on lab safety, responsible conduct in research, and other research-related skills. Students must also complete training through Collaborative Institutional Training Initiative (CITI), if not done already, and submit their CITI certification within the first six weeks of the program; submit an abstract, prepare a poster and participate in the poster sessions towards the end of the fall and spring semester; and participate in the CUNY-wide summer symposium at the conclusion of the program. The Emerging Scholars Program provides a $500 stipend for full-time students (enrolled for 12 or more credits) and a $250 stipend for part-time students (enrolled in 11 or fewer credits) for conducting research with a faculty member. The purpose of the program is to provide students with an opportunity to apply what was learned in the class room to discover new knowledge, to solve real-world problems and to develop professionally while working with faculty to advance scholarly endeavors. The program includes specially designed workshops offered by the Honors Scholars and other programs and participation in a biannual poster session. Some funding for student travel to professional conferences to present results is also available. This is the second part of a two-part application, to be filled out by the student interested in participating in the Emerging Scholars program in Fall 2016. The CUNY Research Scholars Program (CRSP) application deadline is tomorrow (9/15/2015)! Please let me know if any AAS students are interested in programming languages and software engineering research and are interested in applying with me as a mentor. More information may be found on the program guidelines and the application form. 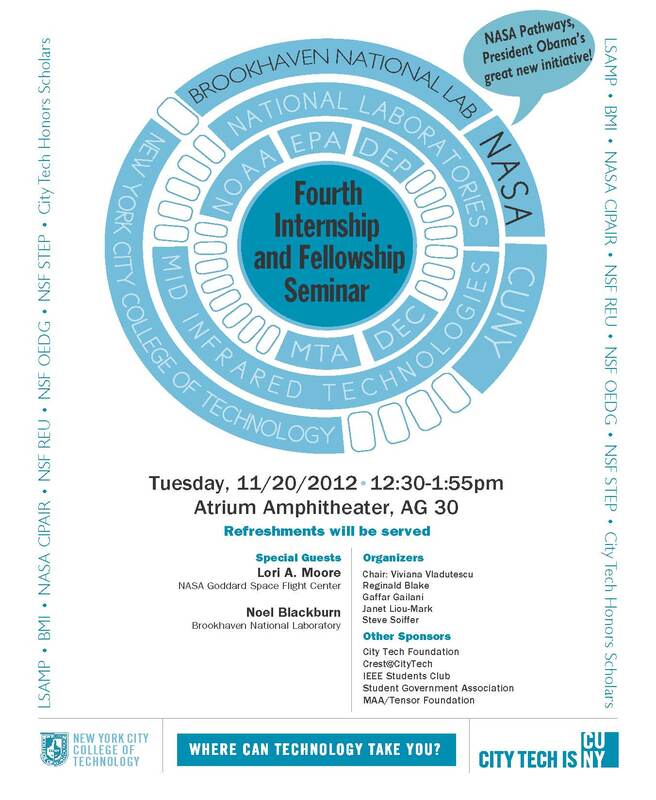 Please note that the program is only available to AAS students. The Office of the Vice Chancellor for Research is offering grants that will be awarded on a competitive basis to fund innovative ideas for incorporating authentic research projects into the undergraduate curriculum. Successful projects will be implemented into new or existing courses and must incorporate a researchable aim. For the purposes of this competition, authentic research is defined as a plan for seeking answers to a research question for which the outcome is unknown. The research question should be based on the expertise of the PI, and should involve the development of new avenues of inquiry. For additional information, guidelines, and contact information, see the Research in the Classroom: Idea Grant page. Use the OpenLab for your research! 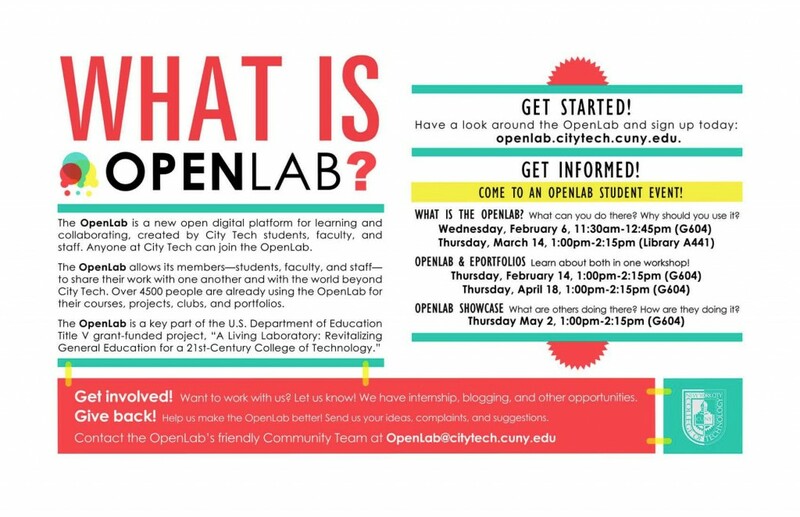 We hope that faculty and students will collaborate on their research here on the OpenLab. It’s a great place for collaborating while conducting research, and for sharing the research results as they are available. 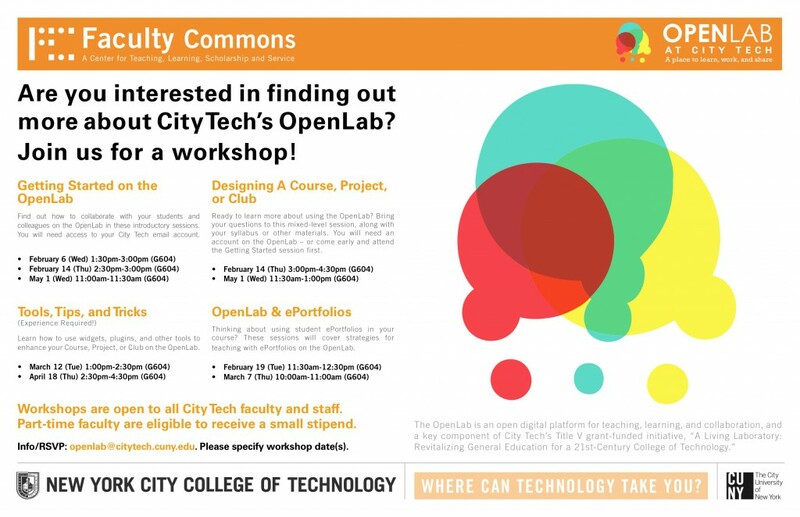 Throughout the semester, there are opportunities for faculty and staff to learn about using the OpenLab, and additional events for students to learn about using the OpenLab. Check out the posters below for more information. Click on the image to enlarge. 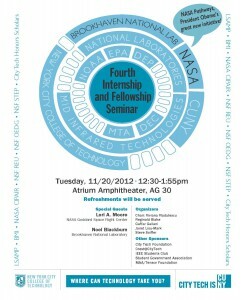 Or download a copy of the Internship and Fellowship Seminar Nov 20 2012 Flier. 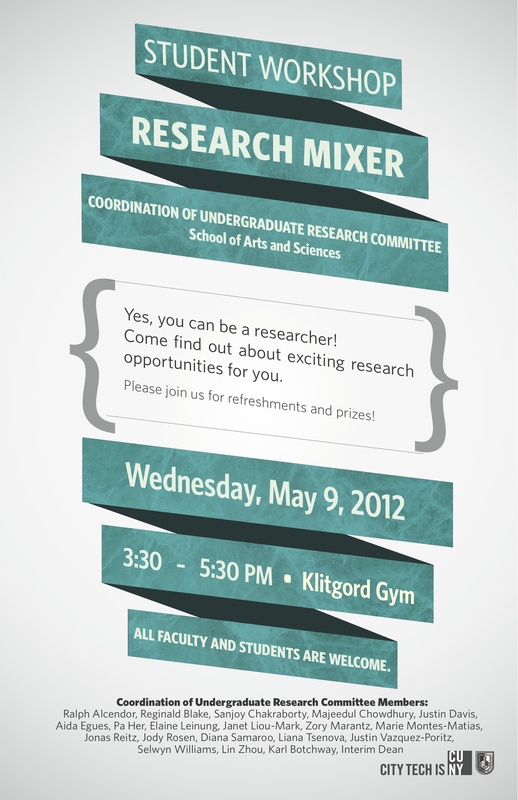 Faculty and Students: Come meet at this week’s Research Mixer!